So, what are the ingredients to an effective recipe to disaster-I mean, defensiveness. Let’s look at some of the most common. Make what’s not personal…personal: Often the things we perceive as personal attacks are not. Rather, they are a result of the other individual’s personal thoughts, feelings, experiences, and internal weather. If we didn’t cause it (most likely), why do we claim it? Mountains from mole hills: Do you find yourself catastrophizing your partner’s bad mood? Seeing the worst outcome from a minor missed expectation? If this is your mode of responding, of course you will find yourself in fight or flight much more often. Find offense in everything: The reason for defensiveness is often rooted in the perception of a threat. If we are on alert for that which might hurt us, then we can possibly catch it in time to stop it. Unfortunately, when we are looking for something…we often find it. Even if it’s not there. Mind reading, mind reading, mindreading: Friend doesn’t call us back right away? They must be mad at us. Partner decides to not join us for dinner? Must not like spending time with us. Boss points out that I could have done better at said task? He/She thinks we are incompetent. If the view of the world and people is that daunting…then “fight or flight” makes perfect sense. Fail to hear people when they speak: Our interpretations can get us into trouble. If I overlay my perception on your words, the true message is going to get lost. And, most likely, it is going to be a message of negativity versus find the positivity that might really be there for us. Always be right: defensiveness often creates an “either/or” mentality. “If he is right…then I must be wrong.” Tied into that is the sense of that right/wrong is our sense of worth. Being wrong=I am wrong. Again, when our sense of self-worth is (falsely) on the line, not being right is a bit too painful. These are a few of ingredients that are often found in the recipe for defensive communication and note that our own perception is almost uniformly represented. There are others, of course. But these are very often present. Defensiveness. Significant enough of bomb in our lives that John Gottman, relationship guru, labels this communication/relational style as “one of the four horsemen of the (relational) apocalypse.” It leaves both those engaging in this mechanism and those on the receiving end feeling de-valued and at more than an arms distance from those we care about. It’s definitely a “good bad habit” to break. Defensiveness is most often born of a sense of self dislike, self-distrust, and/or self uncertainty. If we can’t see the positives in ourselves, then how the hell can others? Yet, the sense (true or not) that we are being rejected or negatively judges by others is painful and scary. So, we put on the armor and fight. We fight by denying we make mistakes. We are unbending that we are justified in our “attack mode” because others might (or have) attack us. We build high walls around our flaws and “imperfections”. Sometimes, a barrier is a good thing…a necessary thing. Like it or not, there are people who will hurt us in life. But isn’t a better remedy to being hurt to let those who can in-in? Instead, defensiveness keeps everyone out. And it’s lonely. And it’s self-fulfilling. Part 2: “Recipe for defensiveness” coming in next post! Nope, not a ‘typo’. There is so much in our current culture that focuses on physical, monetary wealth. It’s the type of wealth we are most familiar with. Money, bank accounts, cars, clothes, homes are all seen as markers to success. And, if the end-and only-goal is ‘things’…well, I guess “they who die with the most toys, wins”. Wins what, I’m still not sure. But in they end they are only tangible ‘things’. Their value is a derivative of our perspective. ‘Things’ don’t make you happy because, if you aren’t happy, nothing can make you so. Then, what’s possibly a key to finding your happiness? I love the home in which I live. it’s a little piece of peace on this planet, for both of us. Many a time we have fielded comments such as “Must be a lot of work”, “Aren’t you afraid of the lake flooding” (been there, done that), “You’re so isolated out here”, and “There’s nothing close to here. Must be annoying to have to drive so far”. And, as it stands, these are all correct statements-to one degree or another. However, what counts is the perspective. If these were viewed as negatives or ‘downers’ in my eyes, the shine would be off the jewel right quick. Flooding lake? Yep. Gone there and bought the t-shirt. And proud of it. We weathered the storm (literally) in 2011 with innovation, determination, teamwork, and some good, gritty muscle. Proved we were tough…tougher than we thought. Nothing close to here? AKA-solitude. A lot of stuff is far, including work. It’s not a burden. It’s a bonus. Game planning time for the drive in/decompression time on the drive home. Also, see above AKA. Gratitude. That’s what gets you to a place where the moment is rich. 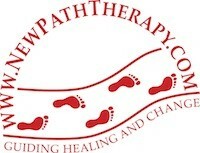 The New Path Therapy Blog is back in action! Lots of thoughts and lots to share. Being presently mindful helps to establish being grounded in the “here and now”. The present is the “where and when” we can have a level of control and influence. This increases our sense of being safe and at peace. We establish our connection to the present through our senses: seeing, hearing, touching, smelling, tasting. Most everything else is either evoked from the past or imagined in the future. This exercise helps to establish a connection to the present. The ‘placement’ of the senses can be changed to suit the environment. Example: If you are doing this exercise while mowing the lawn, ‘4’ things you can hear might be…difficult to achieve. Instead, move ‘hearing’ to #2 and ‘smelling’ to # 4. Be as detailed as you need. Looking for a quick reduction in stress? Simply name them. Example: “I see the tree across the street, I see the blue car in the drive way, etc”. For a deeper, more engaged experience…get more detailed. Example: “I see the tree across the street. The bark is dark brown and deeply lined. The leaves are dark green and spade-shaped. They are partially unfurled. The tree looks to be about 25 feet high and some of its roots are above ground”. Don’t save this practice to only when you are stressed or anxious. Just as it can reduce these negative emotions, it can enhance a peaceful, fun, and meaningful moment. Kayaking on a beautiful lake? This helps you not miss a thing. Enjoying a cook out with your good friends? You will remember this time with even more clarity and with more emotional attachment. Anxiety can result in affected breathing, usually in the form of ‘labored breathing’. These short, shallow breaths do not effectively perform the oxygen/carbon dioxide exchange. This, in turn, will result in increased heart rate, feelings of unease and panic, and even lightheaded and fainting. Often, our first response in realization that our breathing is being compromised is to take…one…deep…sharp…BREATH. Lightheadedness and anxiety abound. Instead, here is a method to gradually increase your chest/lung capacity to accommodate deeper breathing as well as a healthier, more natural gas exchange. Find a comfortable place and position. Work with the ‘count’ to find the pattern that works best for you. Lung capacity and chest flexibility varies from person to person. Take the time to find what’s comfortable for you. Diaphragm breathing-sure, if you are used to it. It is a more effective means of taking a breath. However, if you are not used to doing it regularly it can feel awkward, even uncomfortable. Concentrate first on the bigger strokes then, when you have them mastered, fine tune. If possible, sit up straight with your feet on the floor. Or, better yet, sit on the floor with your back straight. My Tribe: “…It Needed to Come from Me”. Garry Melville is one-of-a-kind! Anyone who finds their life’s work in inspiring and motivating others to “be all they can be” are bound to be full of spirit, drive, and joy. Get to know Garry as MONK(My Own New Knowledge)! What is your birth month and why do you think it is? “October. I need balance in my life”. What’s fun/interesting about your family of origin? “We’ve had a set of twins born each generation for four generations”. What’s something you’ve learned that you had a lot of fun learning? “When I first started hanging around business owners and seeing how much they pushed themselves. I discovered it could be fun to push myself like that. Getting up a 4:00am to beat the day and grab a couple more hours”. What led you to go into the area of motivating and public speaking? “One night, I was so sick with a crippling pain inside. It was so bad that I knew I needed a change. When I had my awakening, I was staring at my phone and looking for a quote to help me make it through. I then realized, after it never came from someone else, that it needed to come from me. For myself and for others”. “My goals. I have a list of ten things to do every day and even if I do eight or nine, I get restless that maybe I didn’t turn every stone”. What’s the first thing that comes to mind when you hear the word “beautiful”? “Being myself. Being goofy, random, silly, and weird. I don’t have to pretend to be something I’m not. I am who I am. Hope you like it but, if not, you can leave it”. If there was one thing you could tell the entire world, what would it be? “Mind your own business! You are worried about the wrong thing. Clear your doorstep then you can help others with theirs”. What is your passion in life and what do you do to facilitate that passion every day? “I’m passionate about connecting. I want to learn about others on a deeper level. Not just “hello and good bye”. Get to know others so we can love each other. “I know I can reach someone new everyday. Just continue to push the comfort zone. Reaching out, posting everyday. Blogging for others to see. I put myself out there. I hope by acting as myself, this act alone, maybe others won’t be scared to do the same”. What question would you want me to ask the next person? It is bittersweet to say ‘good-bye’ to the place my personal practice called home for some time. The Huntington Mills office is no longer available for patients. However, I am excited about what this change will bring. I still continue to practice with John Kuna and Associates and will also continue to see patients through New Path Therapy. Please don’t hesitate to reach out if you are looking for help and for change.